Do you encounter troubles with the process of window cleaning around your property? Your efforts are not enough to remove stains, water streaks and grime from glass surfaces? The professionals of window washing in Stepney Green will help you out! Say goodbye to the endless hours of polishing and wiping – the skilled and experienced team members will manage this matter. You will be able to enjoy your free time – just let us do this time-consuming and exhausting task for you. Our professional approach will grant you lots of benefits. We also provide our professional services in nearby areas: Commercial Road, Shadwell, Aldgate East, Wapping, Mile End Road. You can count on the cleaners for both domestic and business window cleaning. All types of glass surfaces are included in our professional routine. For instance, you can get a service for cleaning small or double windows, sash ones, French doors, bay windows and patio doors. In addition to these, we clean and polish garden window surfaces, greenhouses and roof glass. At home or at the office, you can always get crystal clear glass surfaces – just contact us! We have the skills and the right equipment for the assignment. We provide high quality window cleaning by using next-generation methods. We provide impeccable and absolutely clean look for your glass surfaces, roof windows and conservatories with water-fed cleaning system and jet washing. The poles we use are attached to water reservoirs in our vans, thus eliminating the risk of damage to the exterior of your home or office. In addition, we use entirely safe rope access methods to clean glasses on tall buildings. You can take advantage of these methods now – call us on 020 3746 3113! With our skill and expertise, the good look of your property will be noticeable quickly – the specialists of commercial window cleaning will deal with this matter. 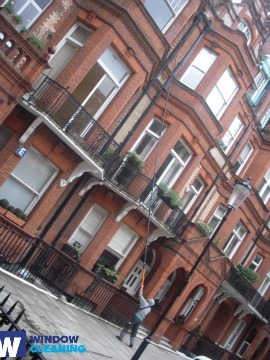 We use water-fed extension pole system for speedy and effective window cleaning, up to the fourth floor. For taller office buildings, we use the latest rope access methods. With our gear, we can reach the highest glass panes, even on the the highest buildings London is so famous about. From small shops to towering business scrapers, we guarantee excellent services – book, now! You will see your sparkly clean home after the professional window cleaners in Stepney Green deal with this task. We provide superb services for the entire London district. The most modern methods are included in our working routine – including water-fed extension pole system and and hard pressure cleaning. You will surely see the change in your home – we use purified water for the process of in and outside window washing. Give us a call today on 020 3746 3113. Our customer agents will help you and answer all of your inquiries. In addition, you can use our online booking from.